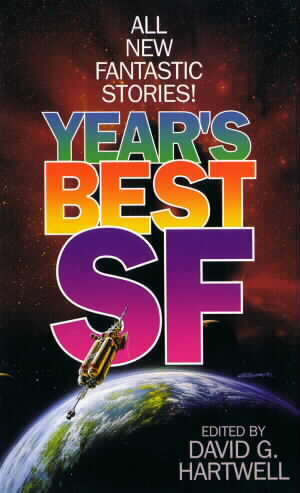 Year's Best SF Edited by David G.Hartwell A book review by jpoc. When David Hartwell started his own annual series of the year's best SF with this volume in the mid nineties, the doorstopper series edited by Gardner Dozois had been running for over a decade. Hartwell made some passing references to other anthologies being unfocused but otherwise he avoided the issue and that begged the question of why this series started and should you buy it instead of or as well as the Dozois book? On the strength of this, the first volume, I am happy to recommend Hartwell's choice to anyone who is into SF in the traditional sense. That does not mean that the contents are old fashioned just that the contents are certainly Science Fiction and not some related genre. The fourteen stories here, all of which were written in 1995, include works by a selection of the best of contemporary SF authors. Writers like Silverberg, Baxter, Benford, Kress, Haldeman, Wolfe, Zelazny and Sheckley rarely disappoint though the last of those is represented here by one of his weaker recent works. The highlights for me were Joe Haldeman's "For White Hill" and Robert Silverberg's "Hot Times in Magma City". The first is a tale of war, art, love and sacrifice set on a ruined Earth in the far future and the second is set in a near future LA beset by volcanic eruptions. The producers of "Volcano" and "Dante's Peak", a pair of similarly themed disaster movies should have studied Silverberg's tale to see how to inject some real humanity into the subject. Like the Silverberg story, William Spencer's "Downloading Midnight", Gene Wolfe's "The Ziggurat" and "Evolution" by Nancy Kress are all set on a contemporary or near future Earth and all three are compelling and rewarding stories. Stephen Baxter's "Gossamer" and Gregory Benford's "A Worm in the Well" demonstrate that the traditional setting of space travel in the Solar System can still give rise to highly enjoyable and original ideas that bring "golden age" styles right up to date. This is not a perfect book, there are still a couple of stories here that left me wondering what the editor was thinking (or smoking0 when he included them but on the whole, the book stands as justification for the fact that there is certainly room for another "years's best" series. If you buy Gardner Dozois' books, you should give this volume a go as well. Getting the series off to a great start. Kelly, James Patrick: "Think Like a Dinosaur"
McKillip, Patricia A.: "Wonders of the Invisible World"
Silverberg, Robert: "Hot Times in Magma City"
Benford, Gregory: "A Worm in the Well"
Spencer, William Browning: "Downloading Midnight"
Haldeman, Joe: "For White Hill"
Barton, William: "In Saturn Time"
Le Guin, Ursula K.: "Coming of Age in Karhide"
Zelazny, Roger: "The Three Descents of Jeremy Baker"
Sheckley, Robert: "The Day the Aliens Came"